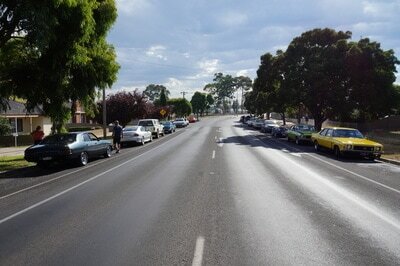 Sunday dawned with the smallest sprinkling of rain that dried almost instantly - not even enough to scare me. 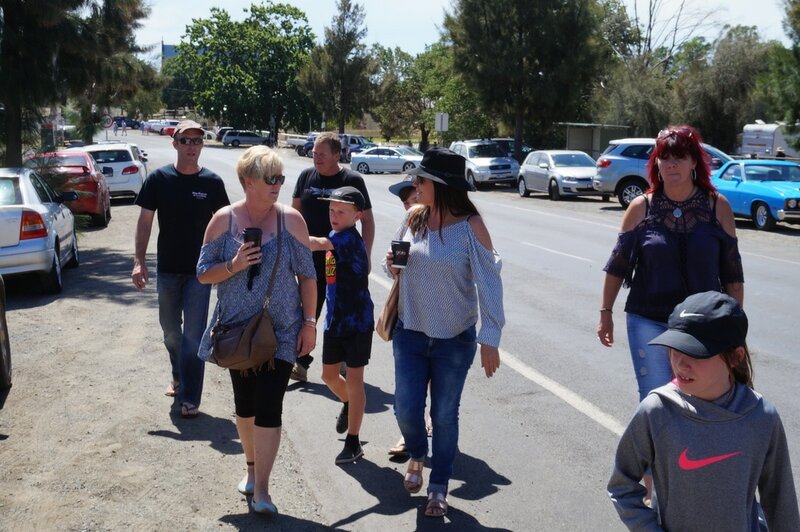 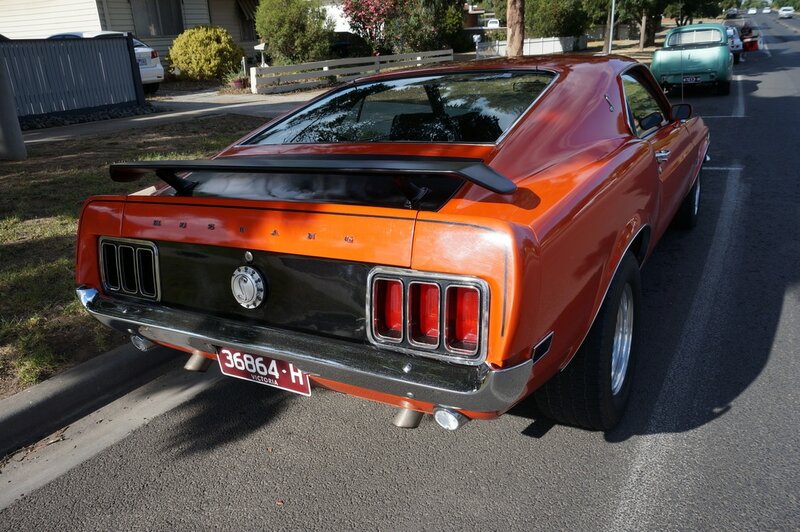 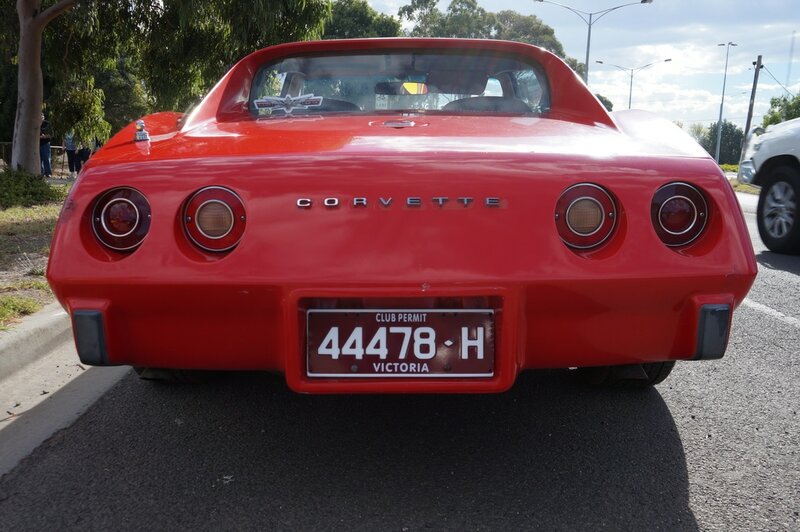 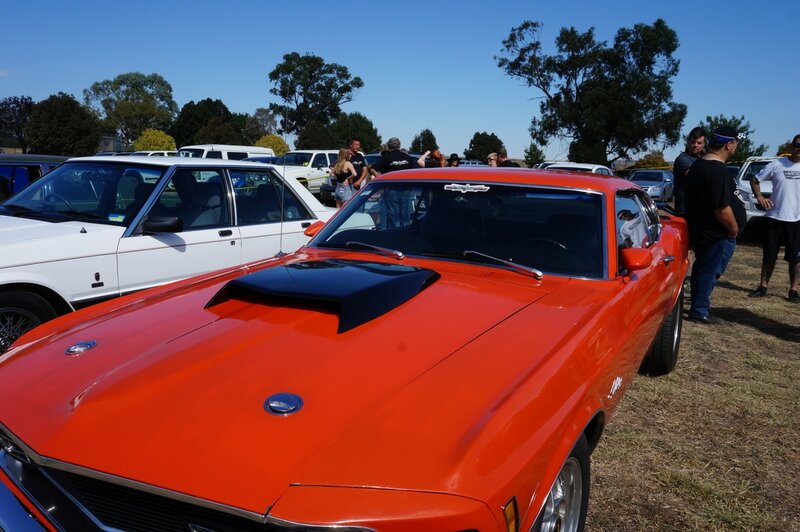 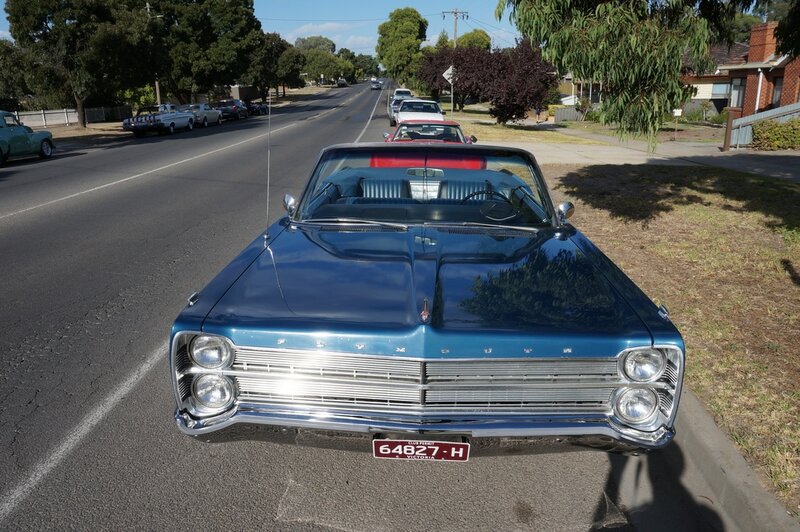 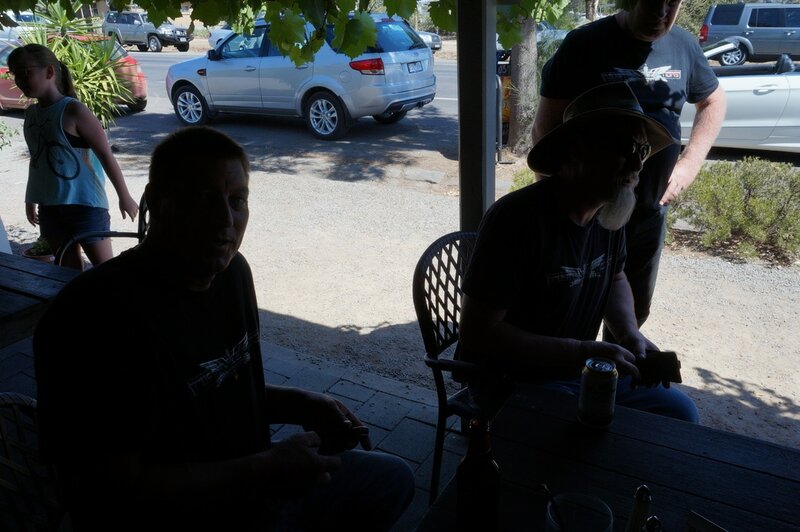 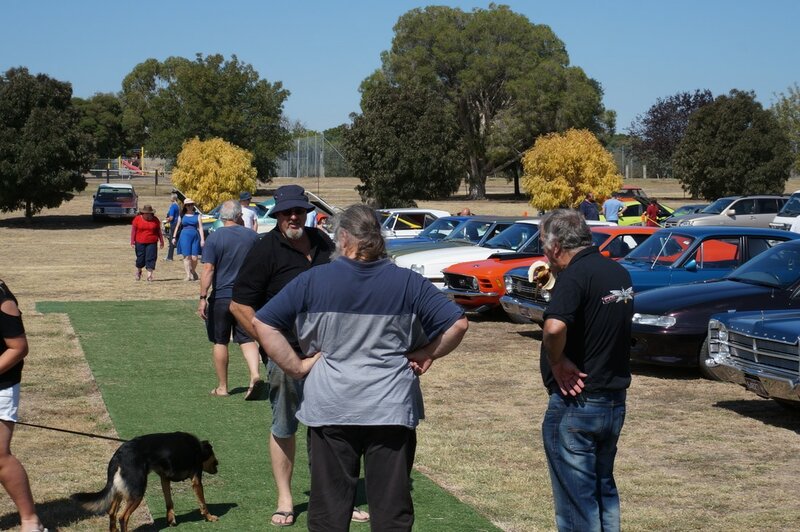 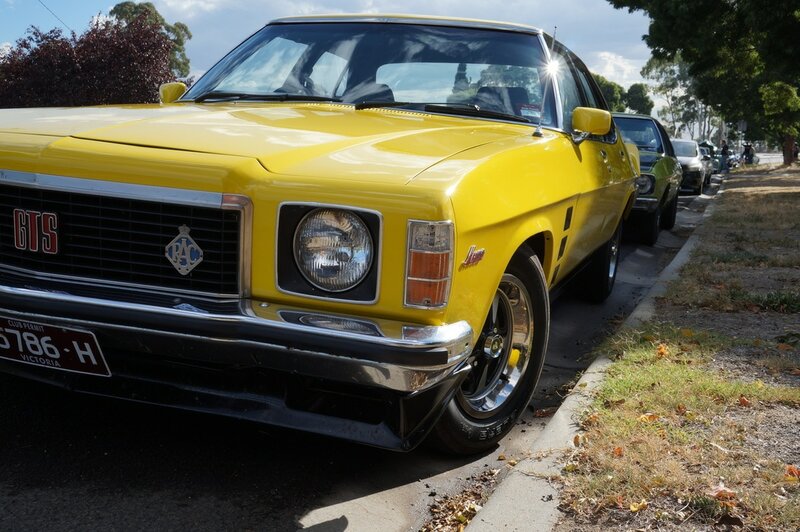 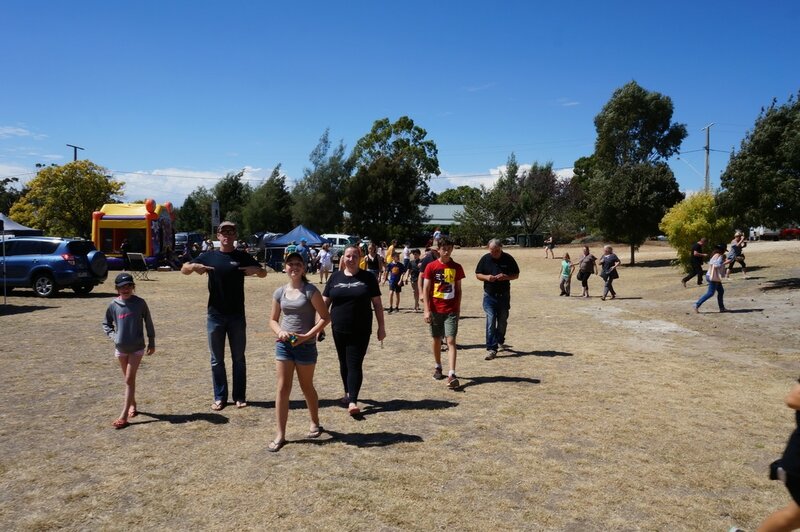 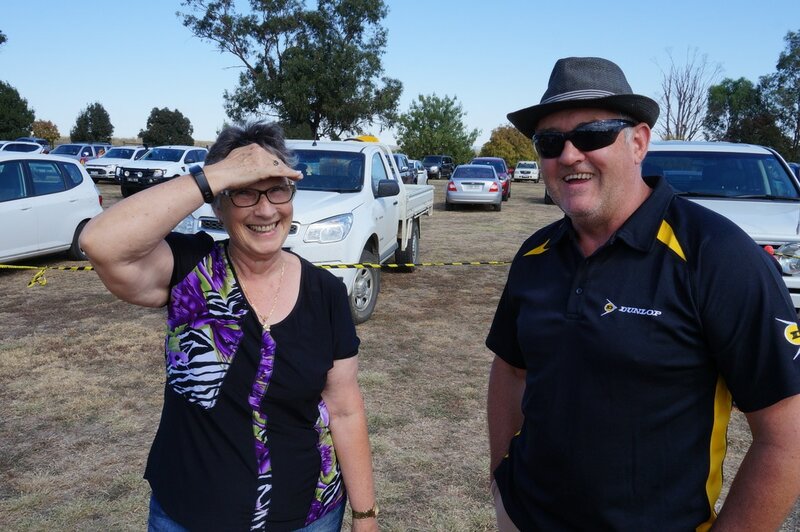 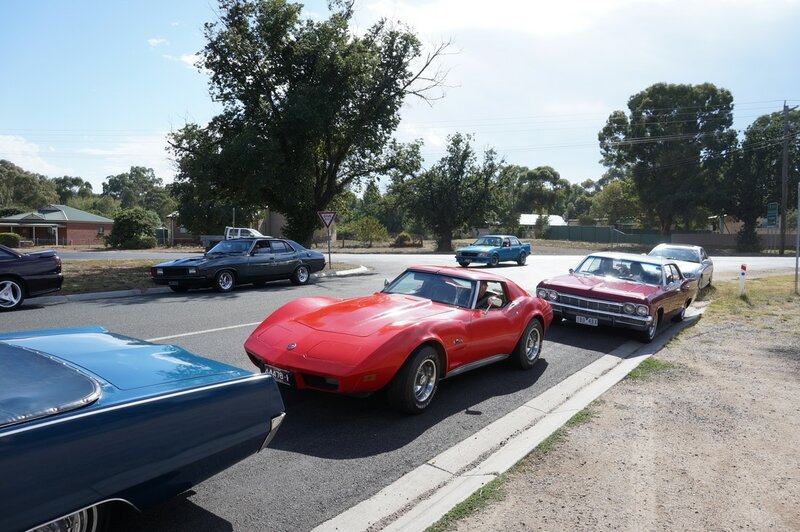 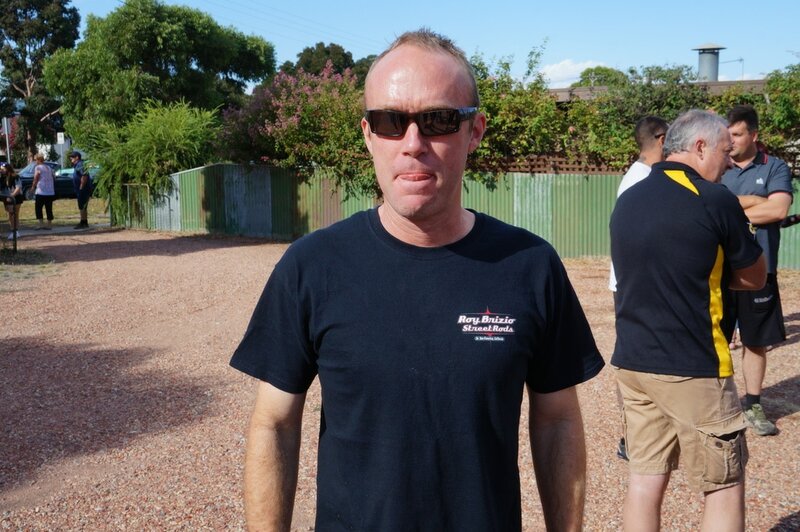 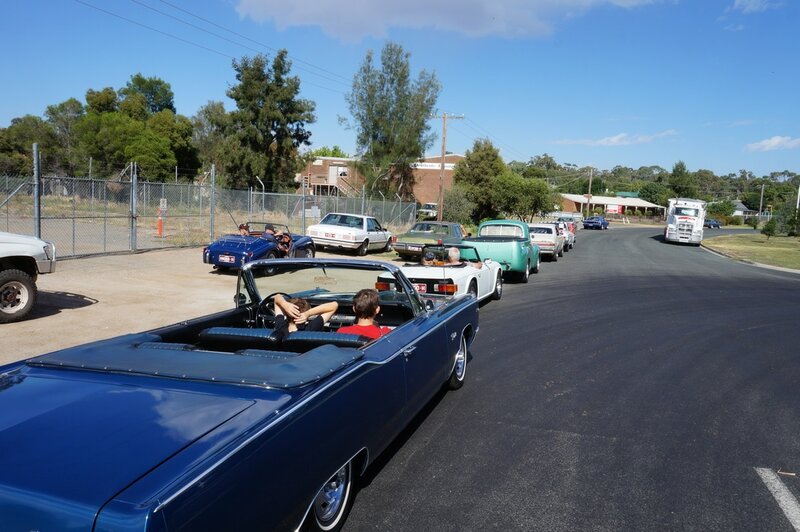 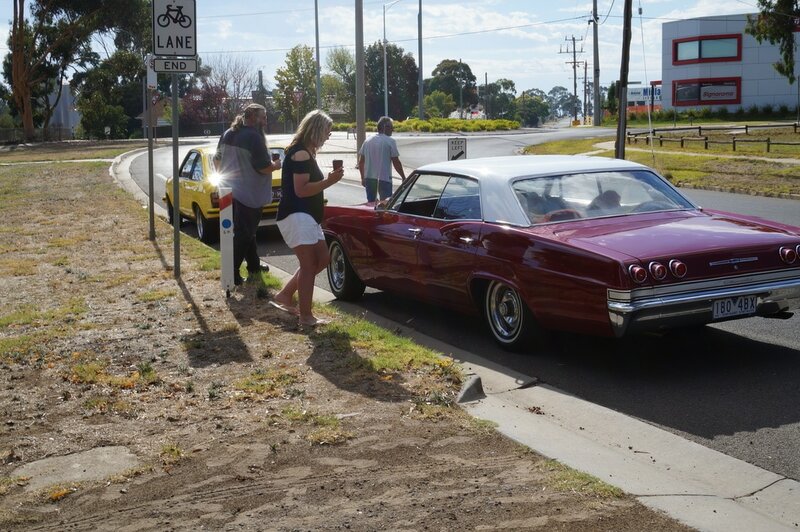 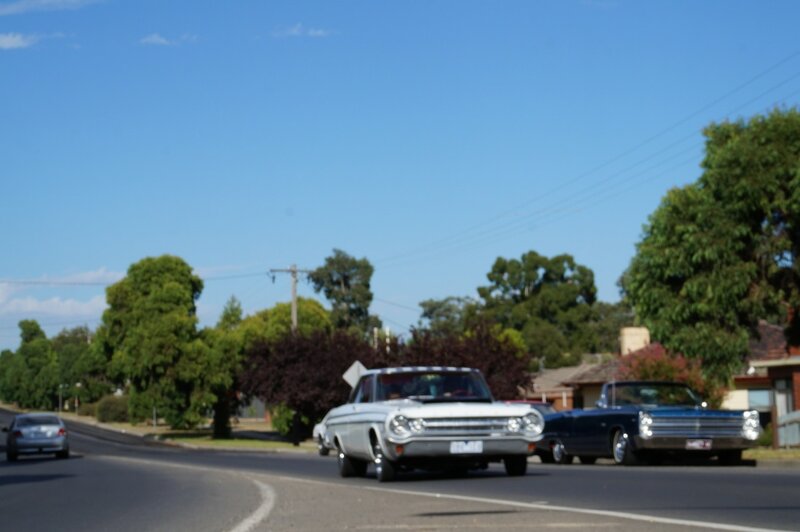 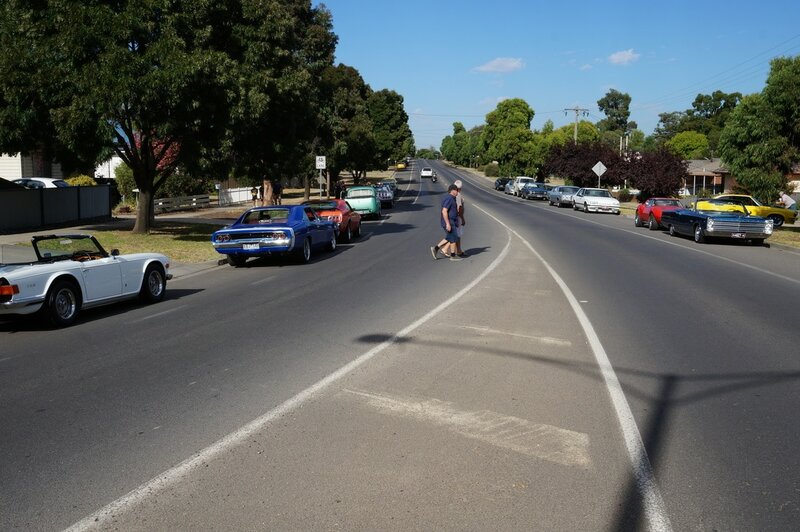 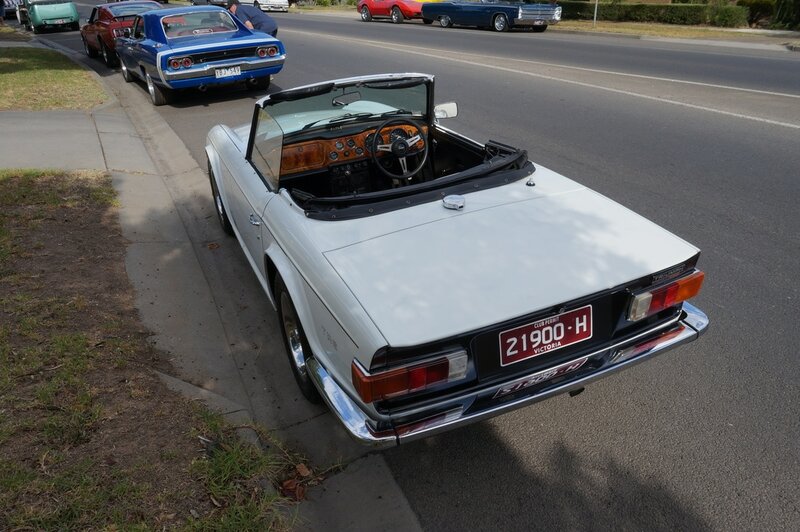 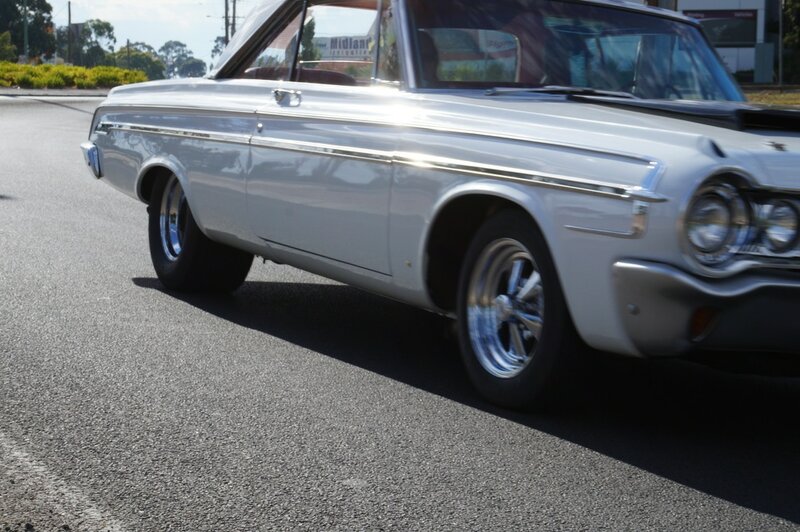 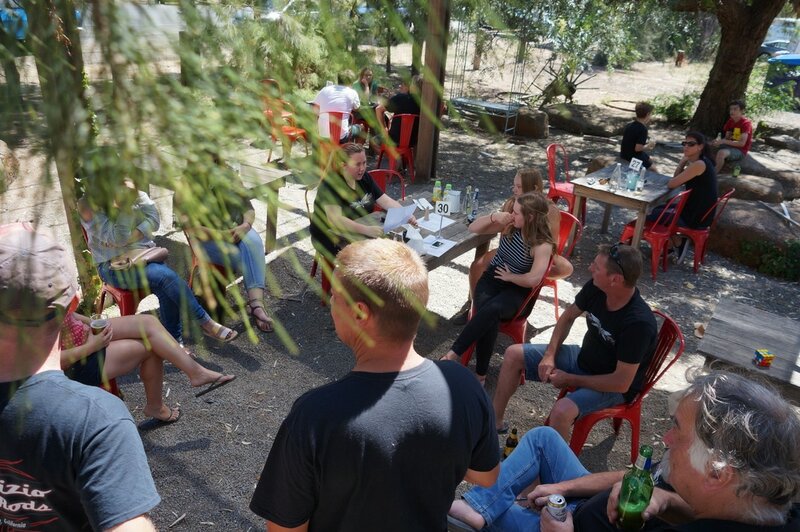 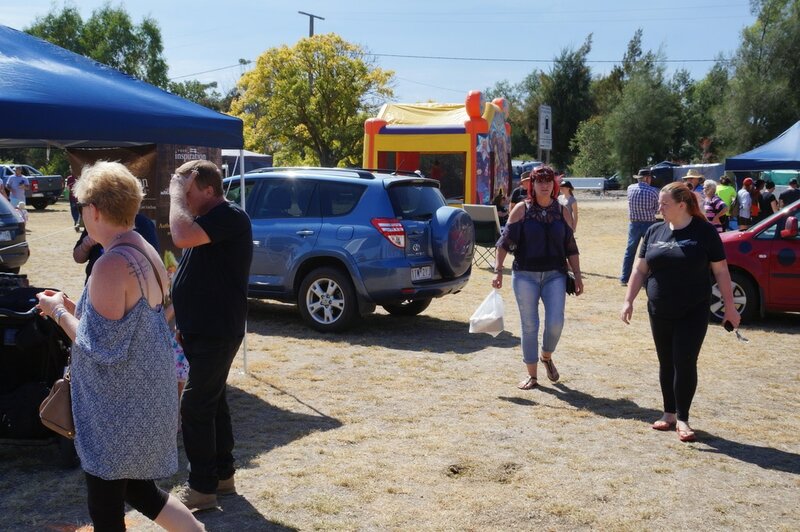 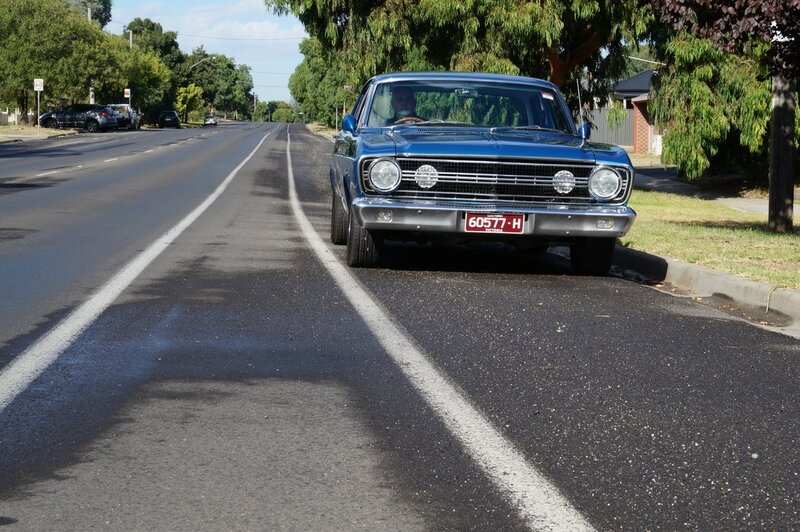 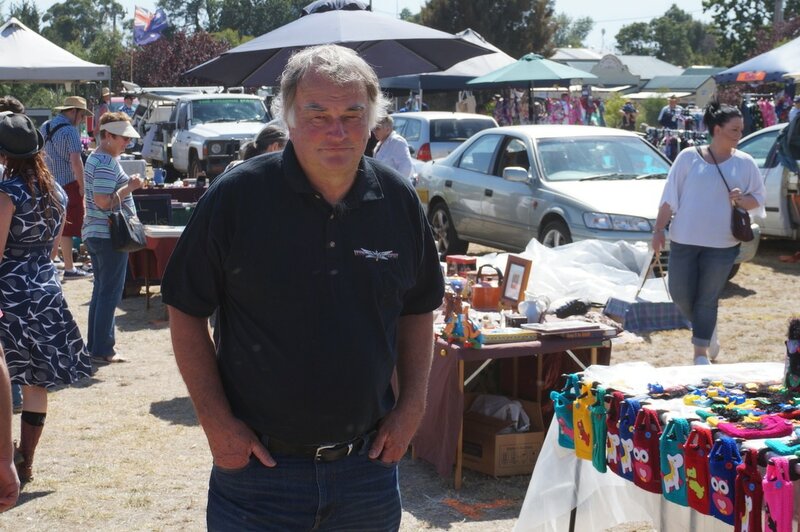 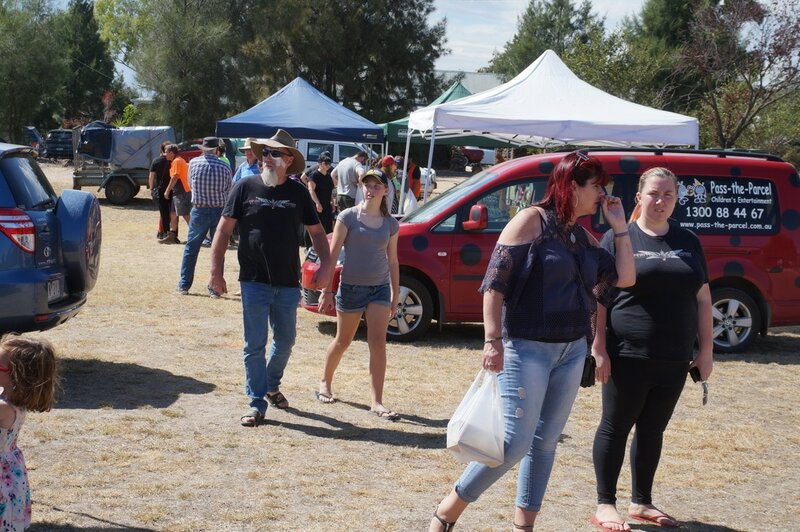 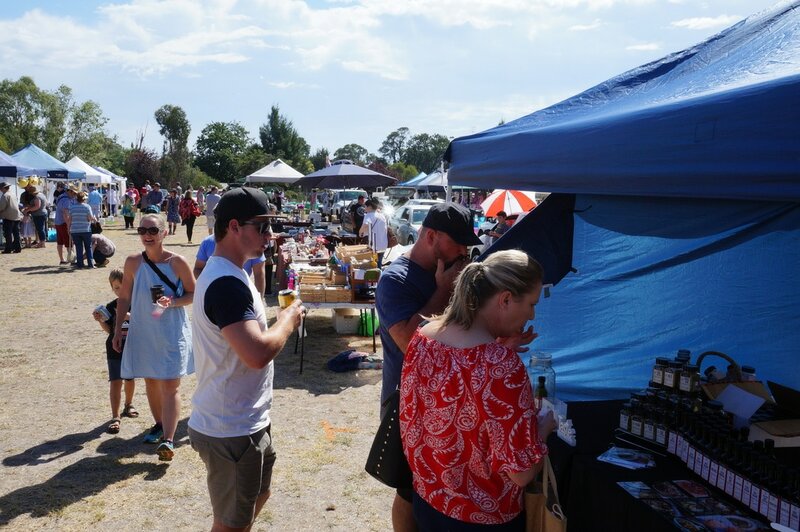 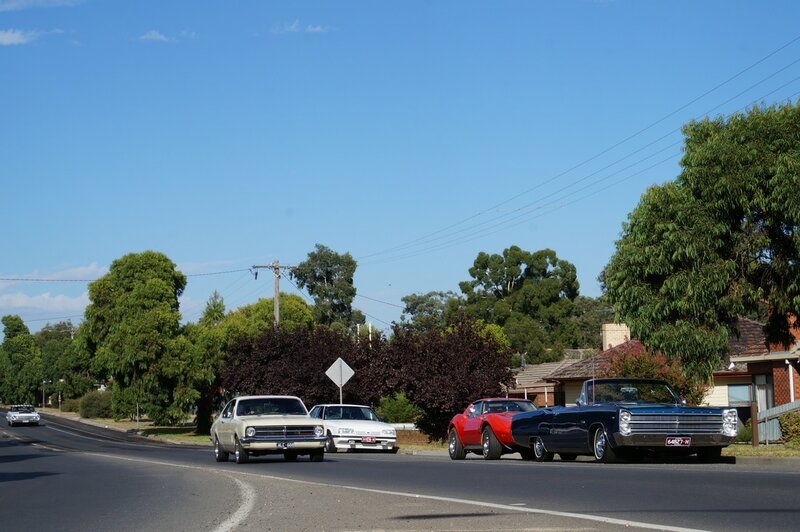 By the time we left the Clubhouse at 10am it was warm and sunny and as we cruised out of Bendigo along the McIvor Highway to Heathcote - the sun in our eyes, the wind in our hair and the smell of unburnt fuel in your nose, I thought it doesn't get much better than this. 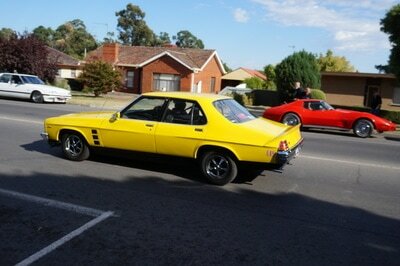 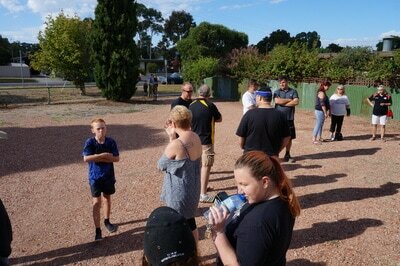 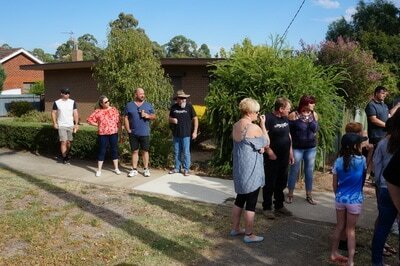 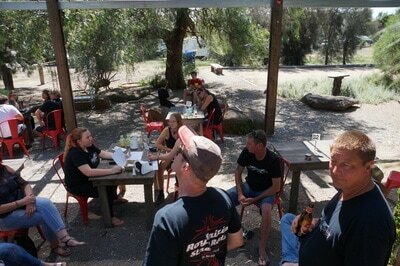 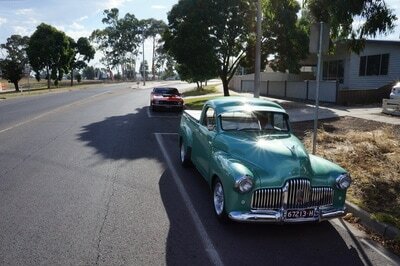 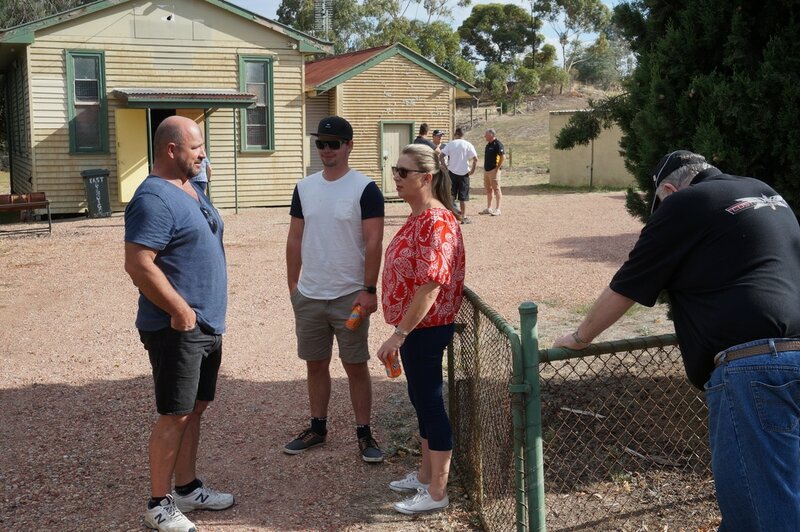 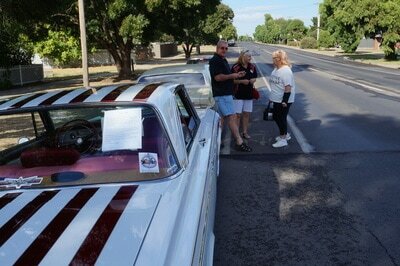 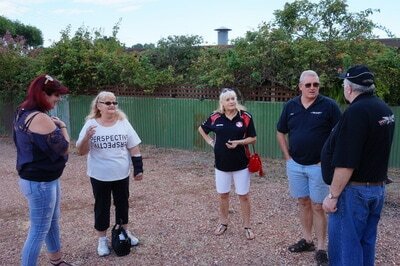 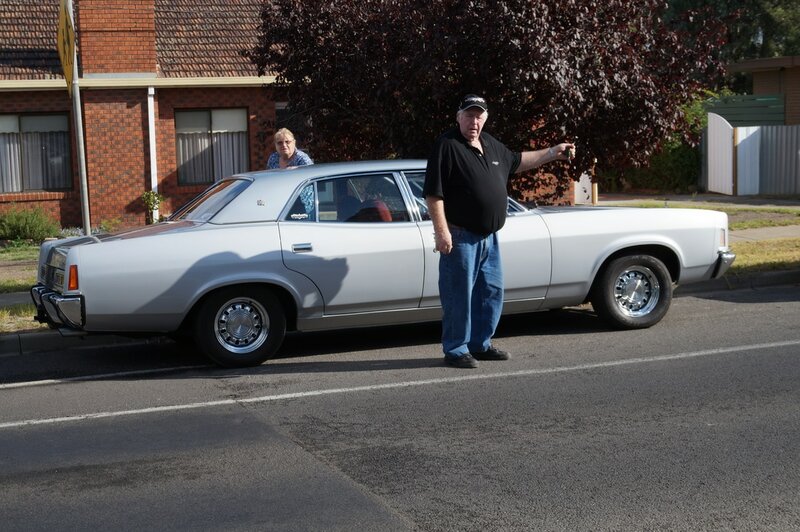 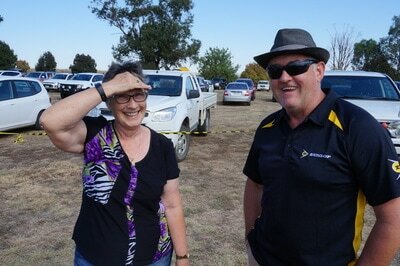 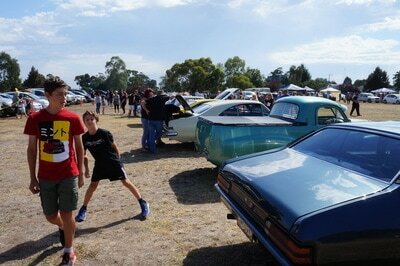 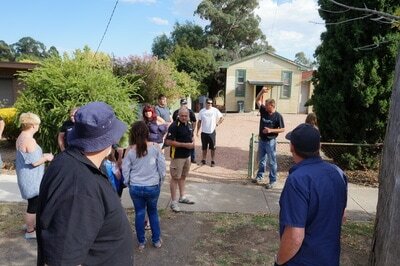 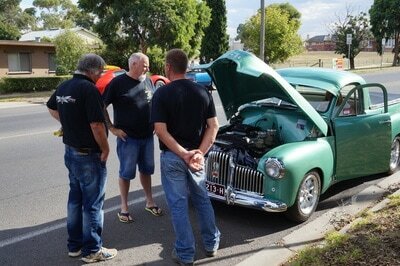 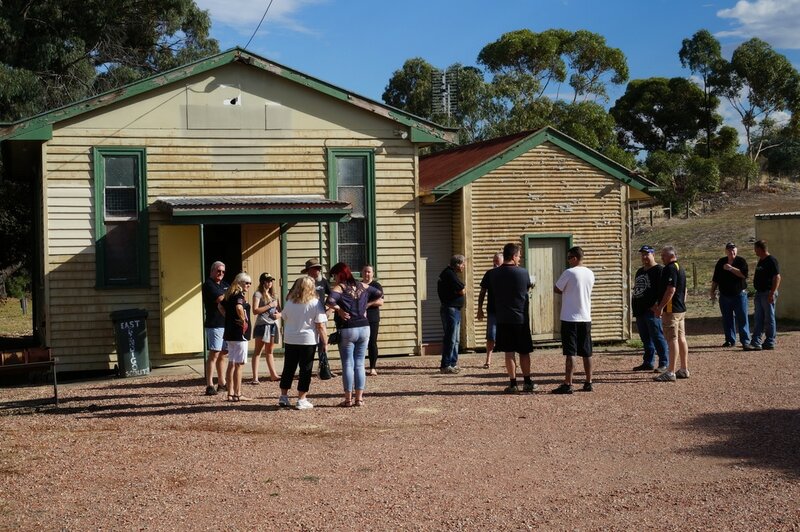 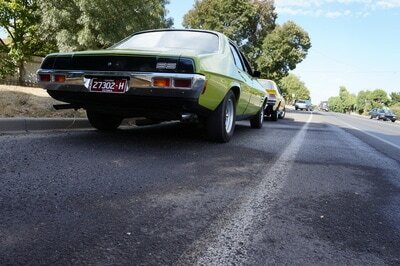 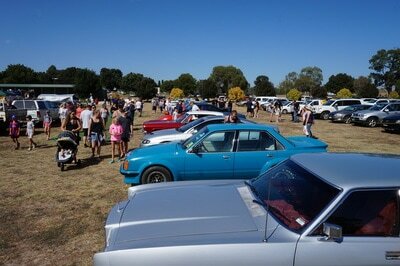 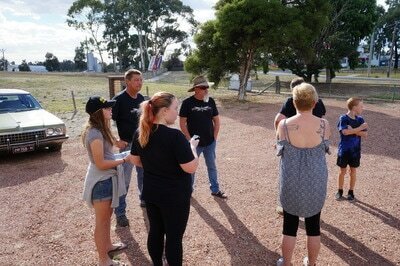 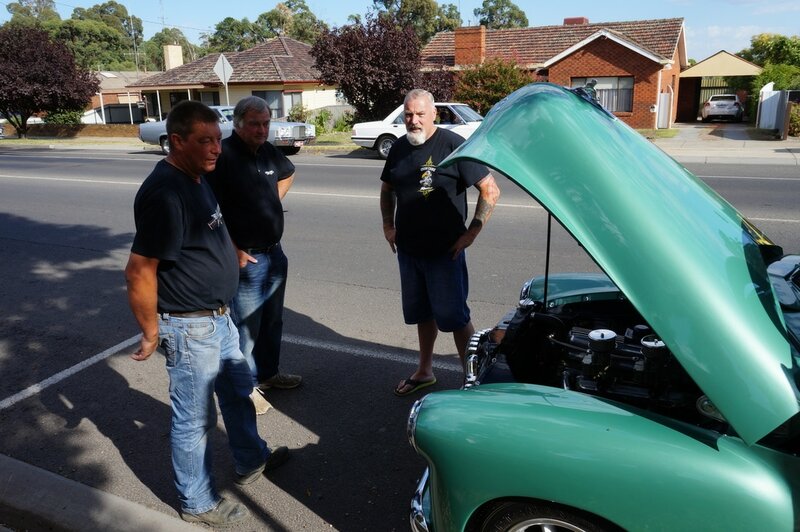 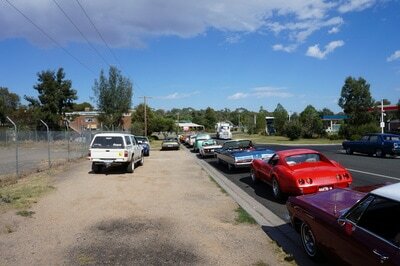 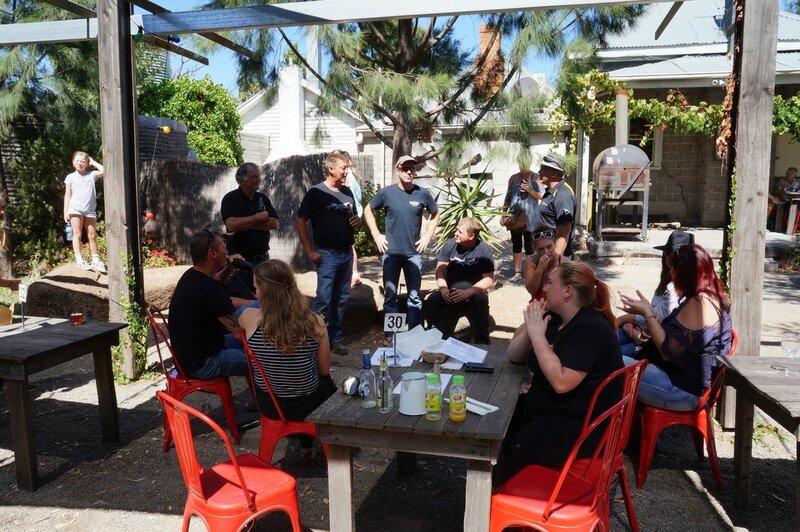 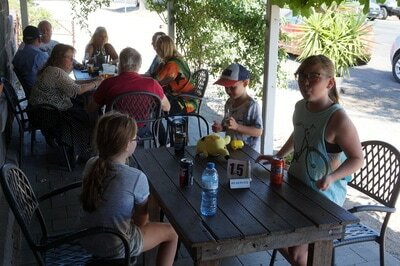 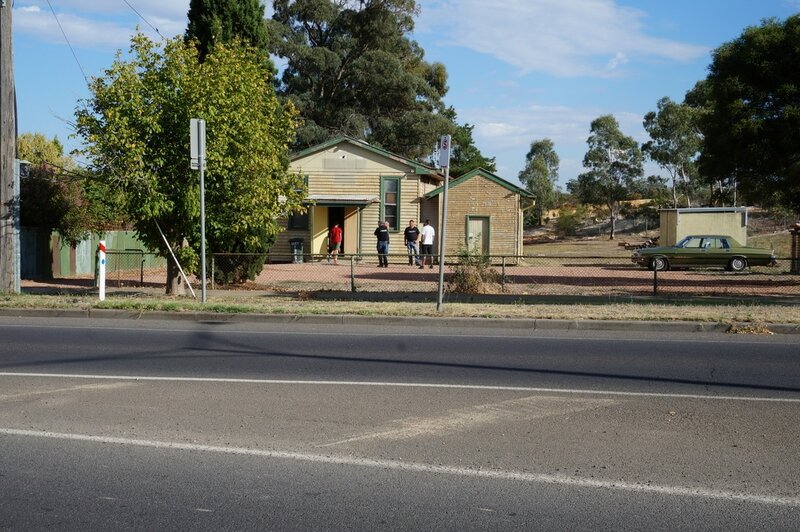 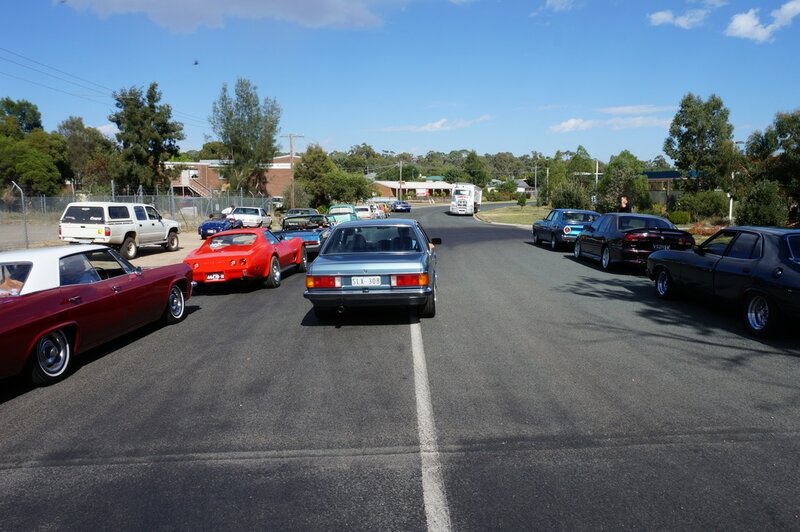 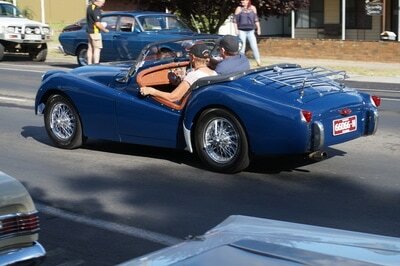 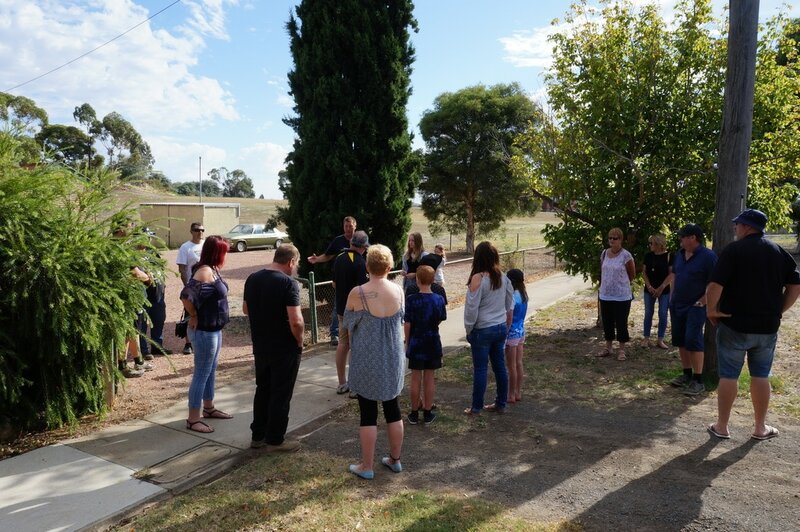 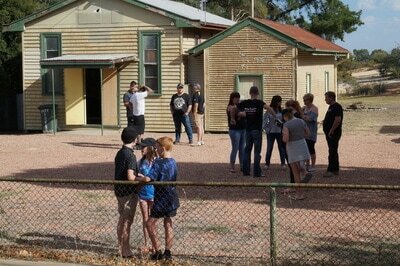 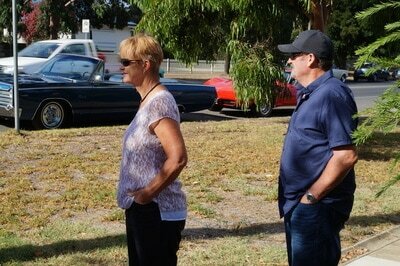 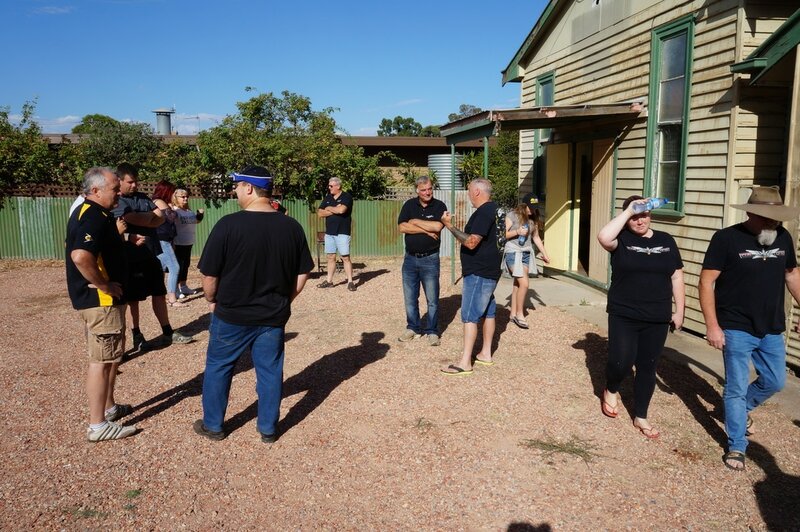 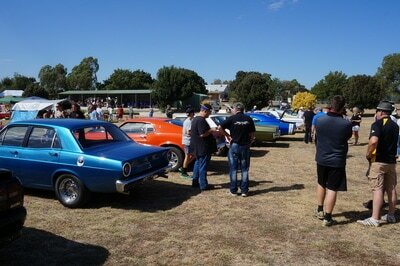 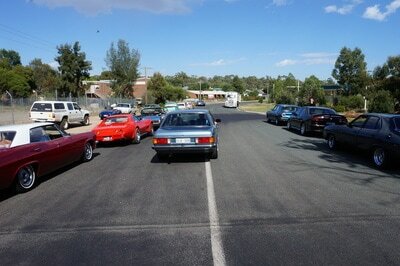 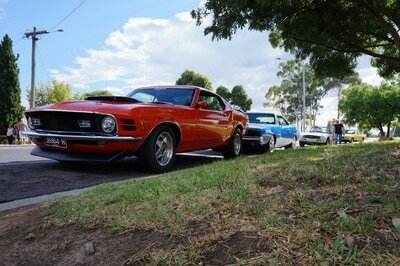 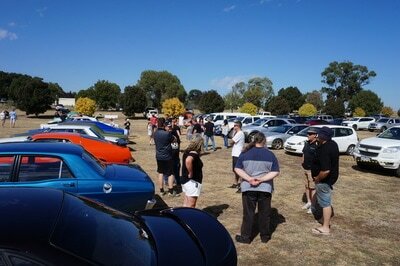 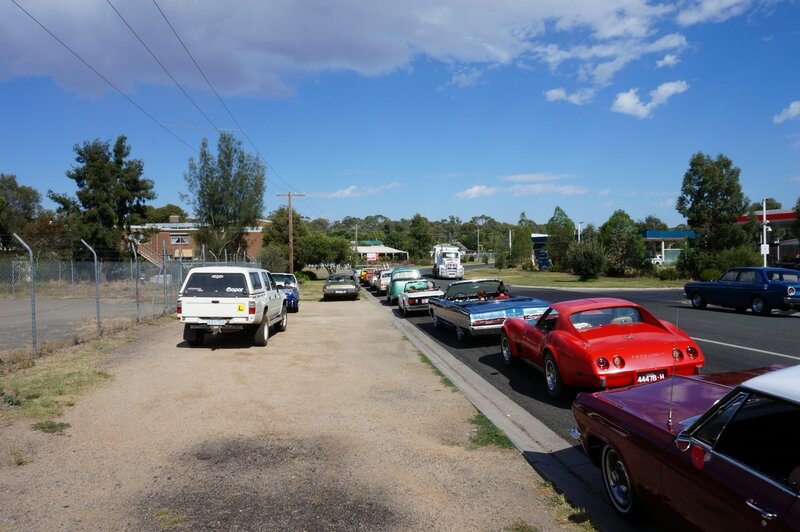 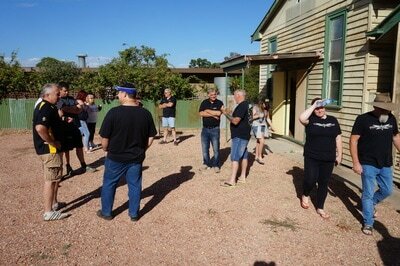 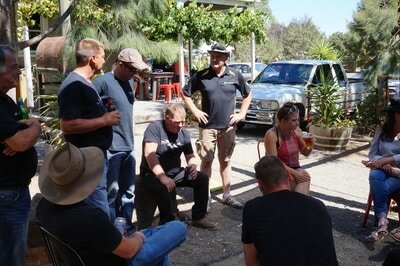 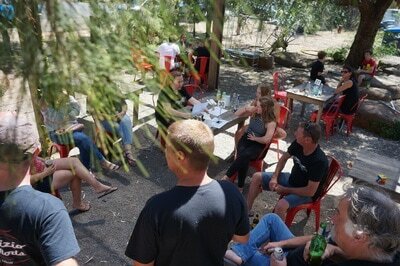 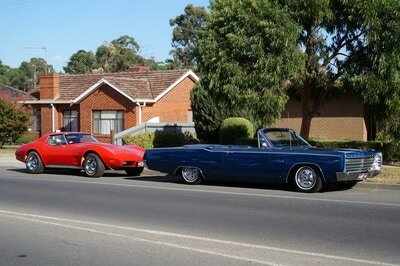 We arrived in Heathcote and pulled up to re-group. 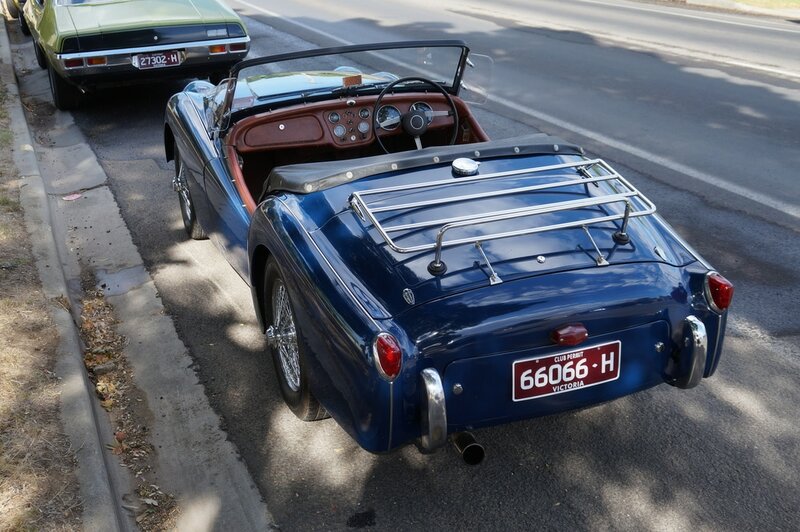 It seems the only casualty on the trip out to Heathcote was the Triumph TR3 (someone tell me if it wasn't a TR3) with brakes that were seizing on and getting extremely hot. 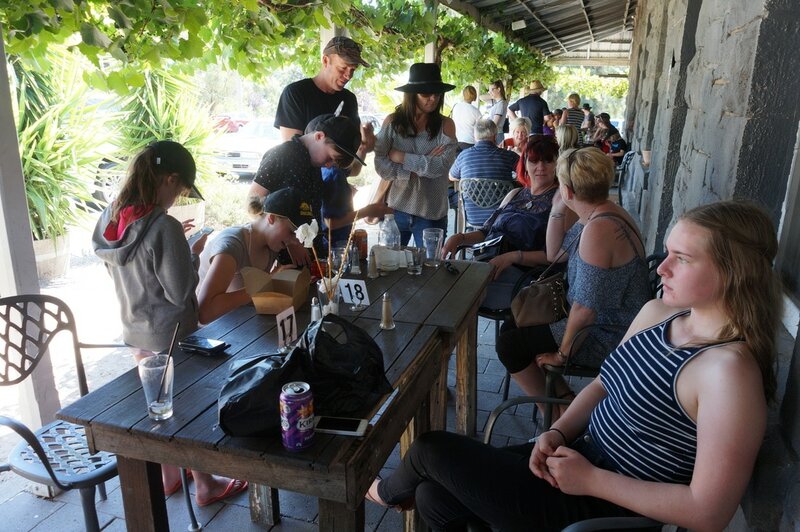 Nothing that a half hour wait wouldn't fix. 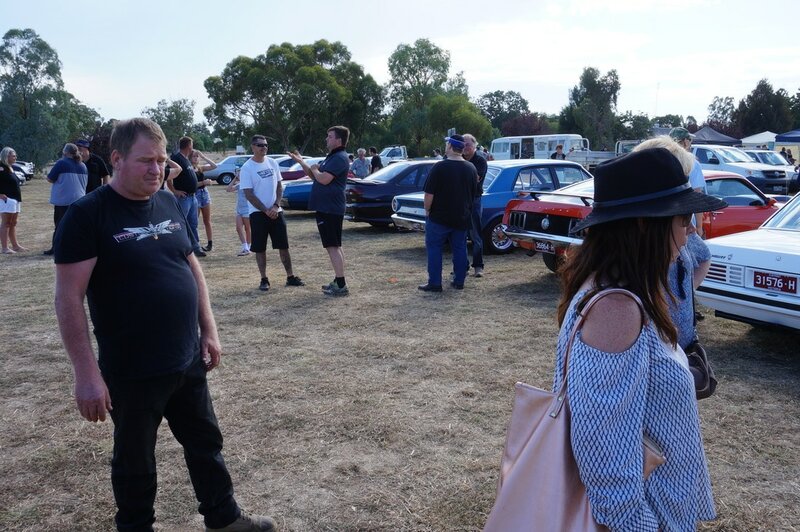 In hindsight, that was most likely the burning smell that you occasionally got a whiff of from a vehicle somewhere up ahead. 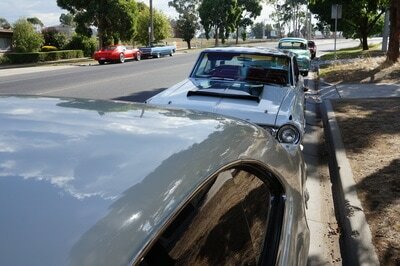 Burnt asbestos. Nice. 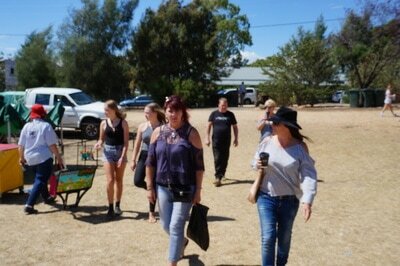 But we moved on and followed the picturesque road through the rolling hills, then down across the wooden single lane bridge over the Coliban River. 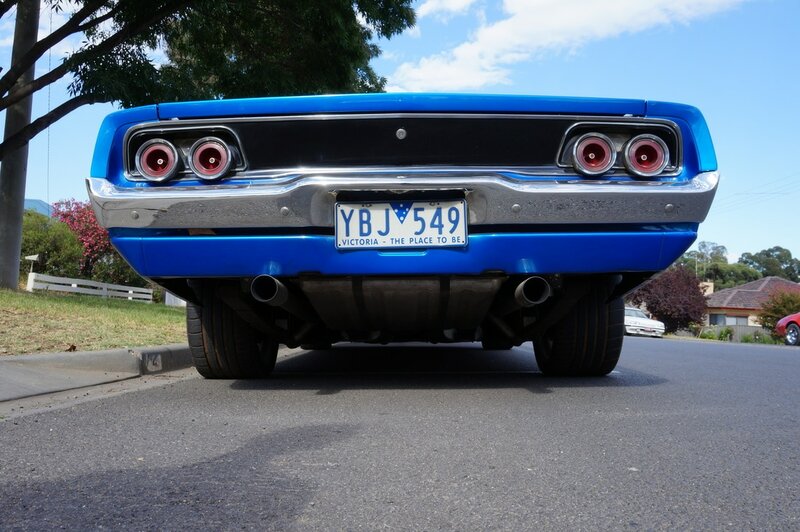 It seems Shane had to stop his Torana in the middle of the bridge to clean his tyres, risking splinter damage to his rubber. 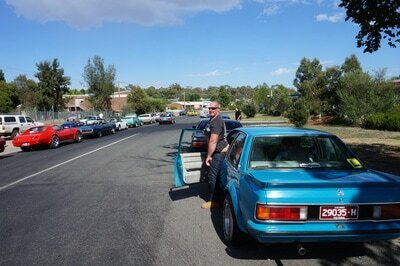 All good, apparently this worked, and they were now clean enough to continue. We rolled into Redesdale and found the area close to the Market that had been roped off for us by the organisers. Much better than last year where we parked up some dirt track. 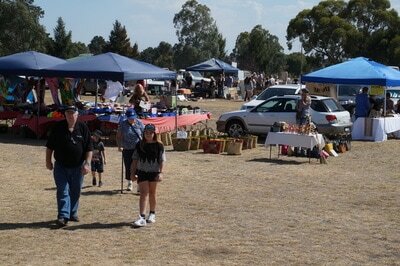 The market was packed with stalls and visitors and quite a lot of people came over to watch us as we pulled in. 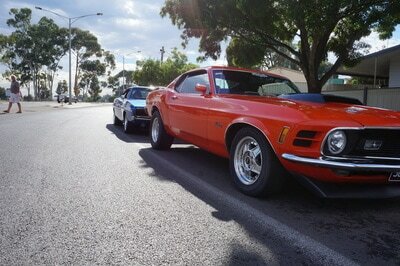 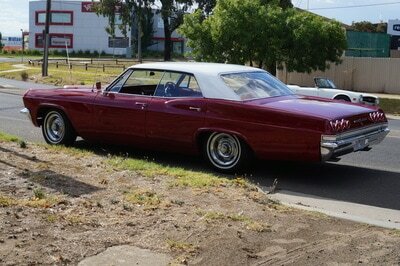 There were around 20 of us, and the huge range of different vehicles looked awesome. The day was very warm now, and after a quick walk around the market, and a tiny $4 frozen slushie for each of the kids, we found our way across to the Pub. 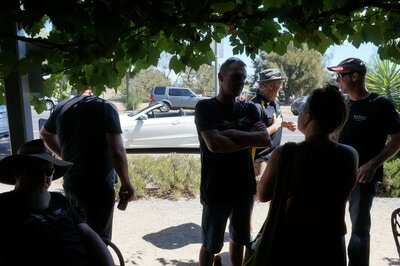 Which, as expected, was packed. No chance of a meal, probably a two hour wait, but they had heaps of cold beer. So the boys downed a few, talked about stuff - some of it true, other bits not so much, some of it too hard to tell. 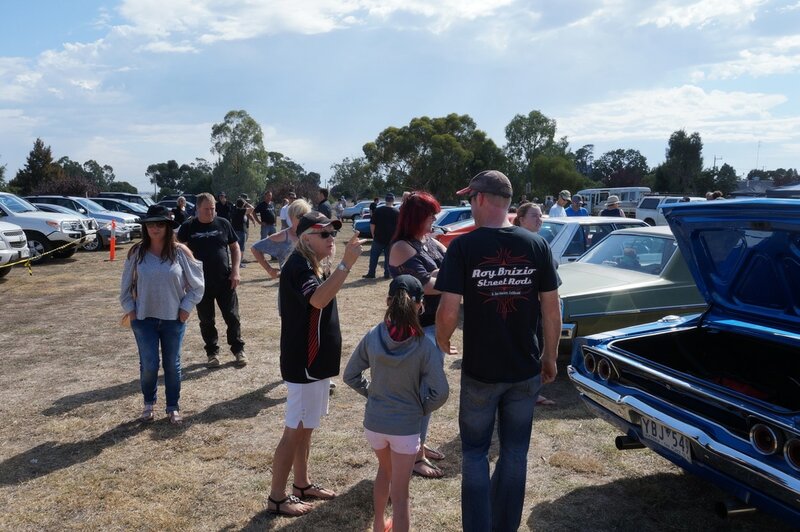 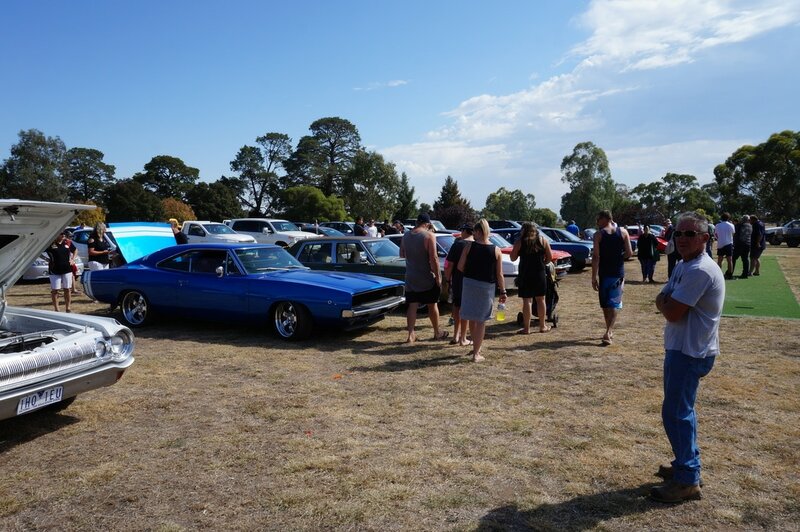 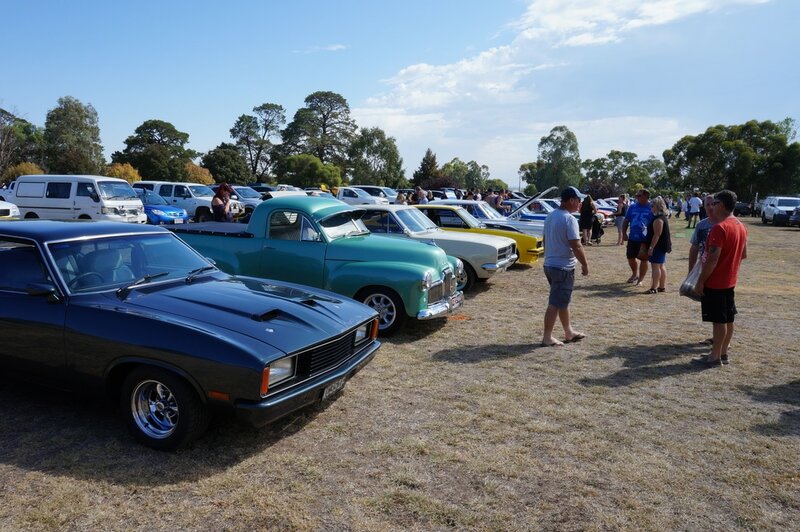 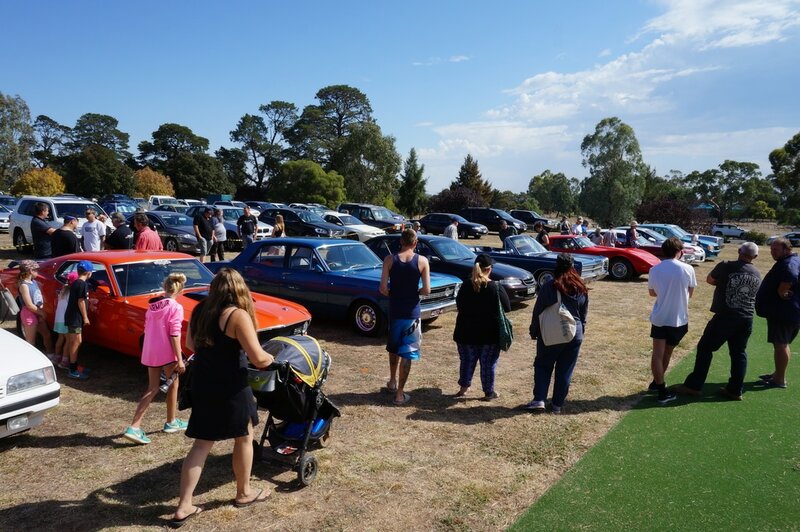 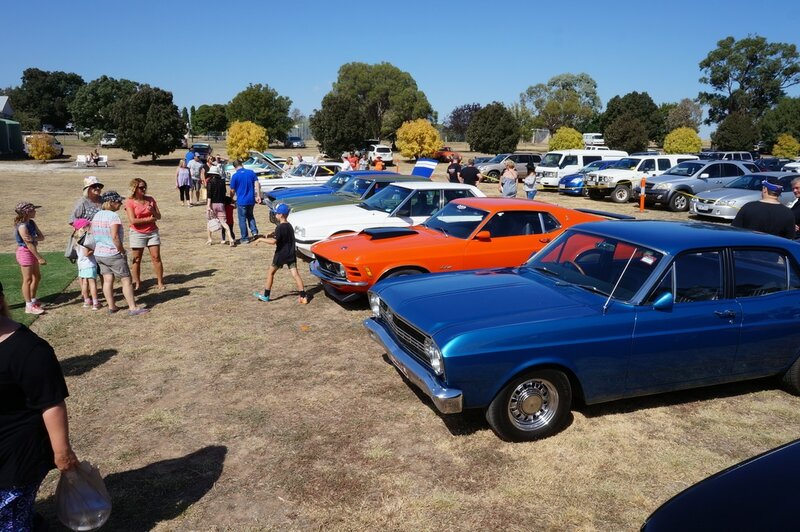 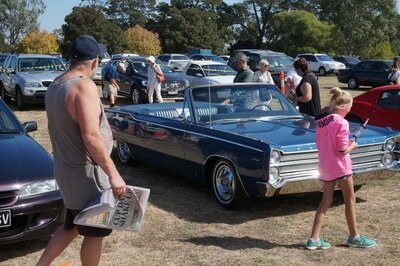 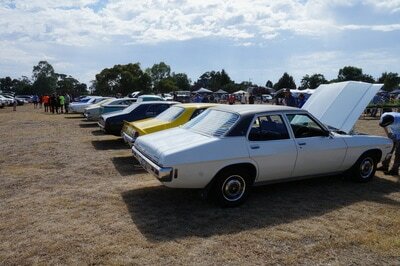 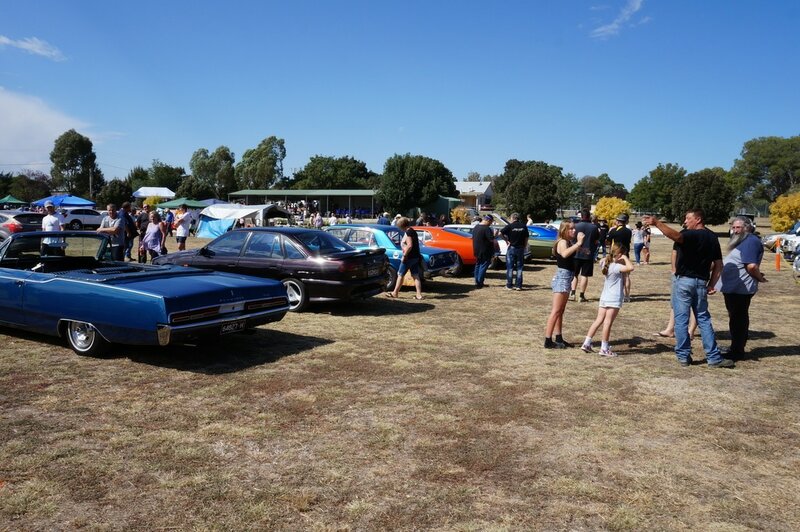 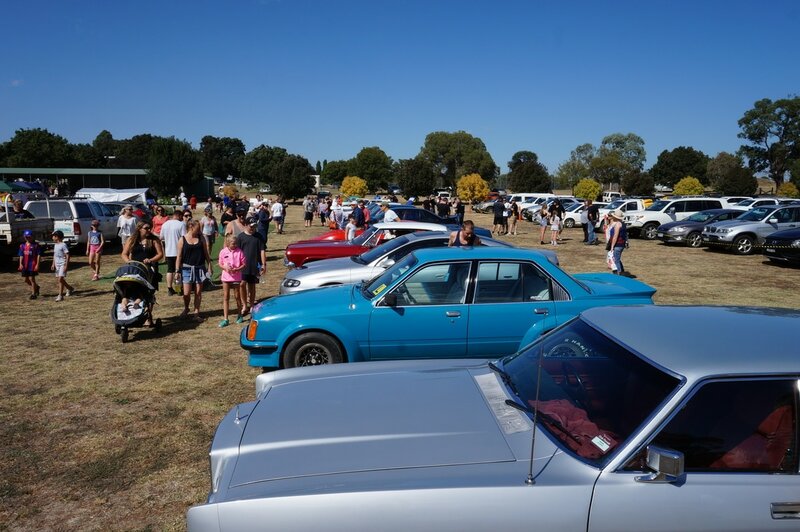 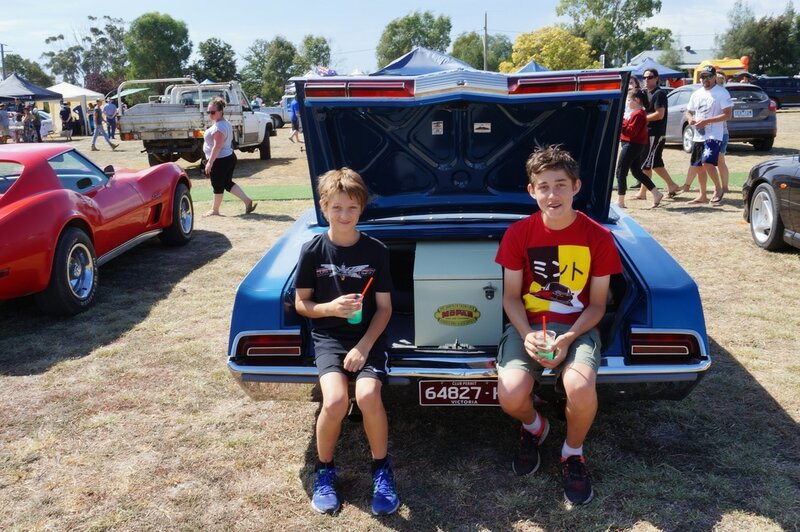 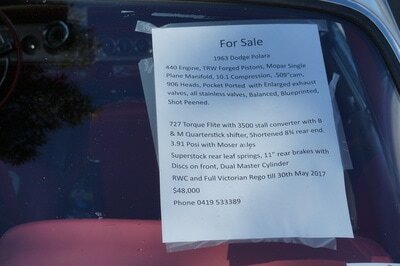 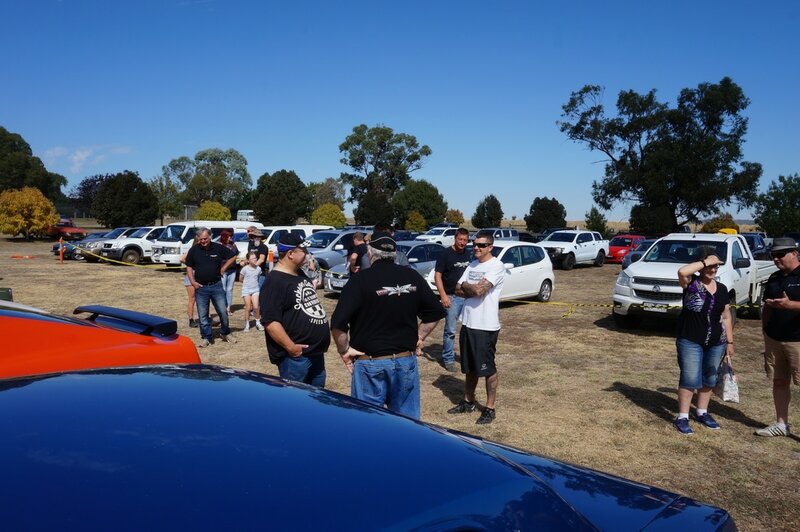 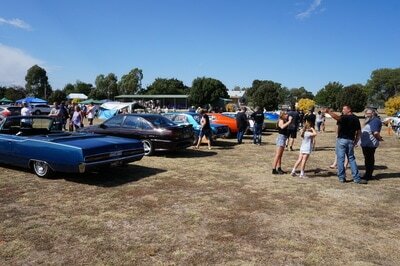 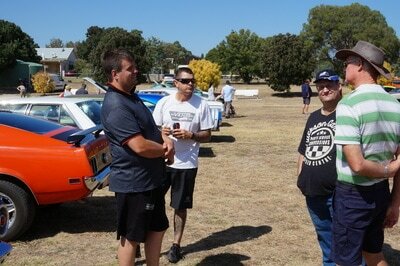 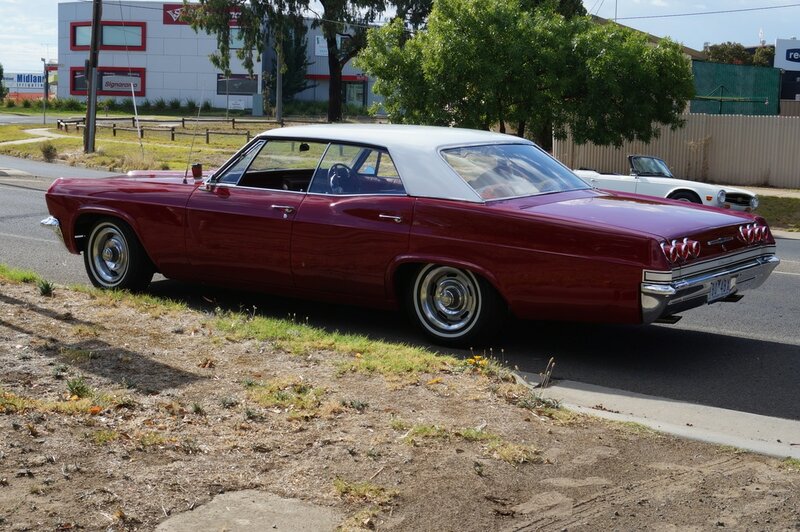 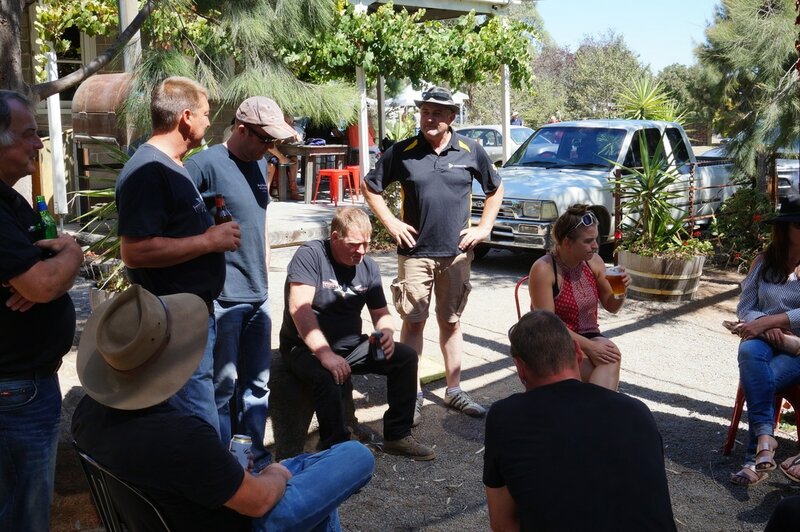 We discussed a Club camping weekend to the Logan Pub Car Show on the 25/ 26th March, so check your text and start organising. 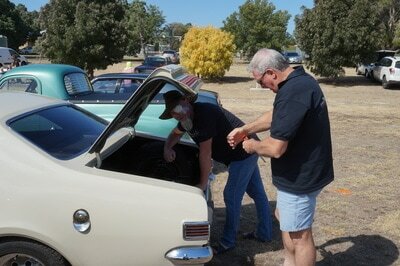 The Club is putting on a BBQ lunch and tea on the Saturday and bacon and eggs for breakfast on Sunday morning. Will be big. 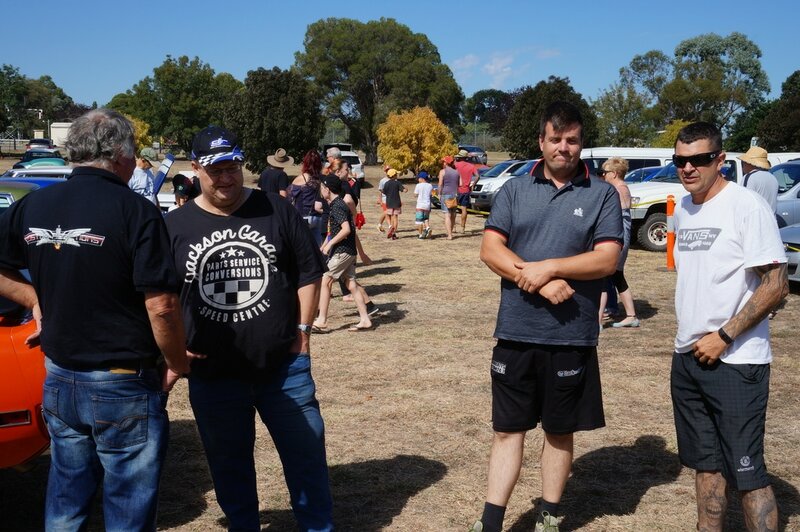 Members started moving back to their cars and leaving Redesdale, with the last of us heading back to Bendigo around 2.30pm. An early afternoon, with plenty of time clean the dust off the car and give it a quick vacuum whilst enjoying a couple more coldies. 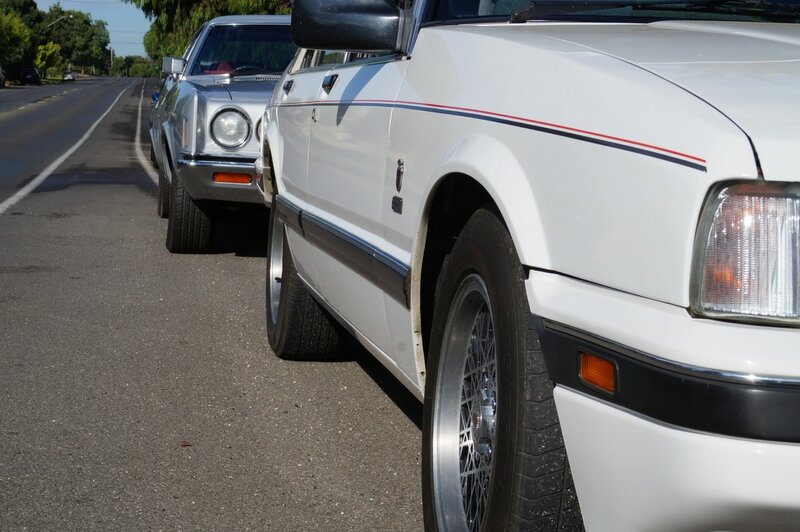 If that sounds like we had another good day, then you'd be correct.